Over the past decades, healthcare has experienced an explosion of innovations that are designed to improve the quality of life. The healthcare IT industry faces significant challenges such as the cost pressures, a changing regulatory environment and an increase in the expectation of the customers. To keep pace with the booming market needs, healthcare technology companies need to augment their existing enterprise applications (e.g., EHRs & RCMs) and look for new innovative ways to deliver value-based care. 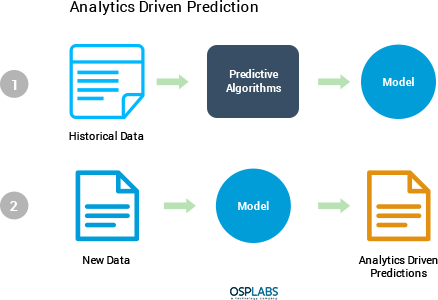 Predictive analytics encompasses a variety of advanced analytics that integrates historical data, machine learning technology, and artificial intelligence to forecast the outcome of the future. All information is implemented into a mathematical model that considers the significant trends and patterns in the data. The model is then applied to current data to detect what will happen next. 47% of the healthcare organizations are using predictive analytics in their healthcare operations, wherein 57 % believe that predictive analytics will save the organization’s cost incurred annually by 25% in the coming years, according to a recent report by the Society of Actuaries. Creating a new wave of innovation in the healthcare business, it can transform the whole landscape harnessing big data and implementing the right infrastructure to generate actionable insights. A 2011 study report displayed that a non-adherent patient suffering from high blood pressure spends an approx. of $3,908 more per year for healthcare than an adherent patient. For congestive heart failure, the additional cost the patient must bear is predicted to be $7,823, and for diabetes, the estimated value is $3,765. Penn Medicine estimates using the traditional medicine of diagnosis around 20 to 30 percent of the heart failure patients have not been appropriately treated, but with the advanced predictive models these patients were quickly identified, and proper education was provided to them to monitor their health. Analyzing the problem carefully that you want to address and then gather the initial data necessary. Risk stratification (risk scores) – Risk stratification scoring can aid the health systems to prioritize workflow of the clinical operations, reduce system waste, and create financially effective population management programs. Simulation (what-if scenarios) – Another approach that plays a crucial role in supporting the clinical operations is a simulation (what-if scenarios), which are significant when decision makers want to ask a simple “what if” questions about the administrative processes. Mapping (geospatial analysis) – Mapping layers and predictive analytics are widely utilized to predict weather condition, improve the efficiency of the supply chains, and support military deployment. This approach is also used to influence GIS mapping of healthcare facilities, patient disease burden, and accountable care populations. Machine Learning and Artificial Intelligence algorithms play a vital role to boost up predictive analytics solutions in Healthcare discovering the new statistical patterns in a business. Machine Learning will help the healthcare professionals to predict the likeliness of illness, utilizing a modeled program. Myriads of the healthcare companies are employing machine learning based predictive analytics that provides various analytics and risk management tools that aid in making decisions, focused on enhancing the patients’ safety and healthcare quality. With the emerging need to lessen the healthcare costs and the people demanding more for personalized healthcare, the healthcare industry faces challenges in the significant areas like electronic record management, data integration, and computer-aided diagnoses and predictions of the diseases. That’s where AI plays a vital role. Artificial Intelligence (or AI) is a type of computer science that mainly focus on creating systems that automate “intelligent” processes – i.e., human-esque tasks like making decisions, solving various problems and learning. Basically, When artificial intelligence boosts up predictive analytics, across scale, speed, and application. With AI, predictive models can manage massive volume of real-time information, and it will usher a new wave in the clinical operations. It also aids in providing early reminders for conditions like seizures or sepsis, which often require in-depth analysis of highly complex datasets. Diagnosis Accuracy: Predictive analytics helps the doctors to provide the patients a more accurate diagnosis with better treatment options. For, e.g., When a person is suffering from any disease, instead of a doctor relying solely on their knowledge for proper diagnosis they can switch on to predictive analytics. With the efficiency of predictive analytics, a complete analysis of the patient’s previous medical history is done against an elaborate databank that helps the doctor to make a more precise diagnosis and design a treatment plan sooner. Preventive Medicine: Modern lifestyle has given rise to several life-threatening diseases which if not treated properly can seriously take a toll on our lives. Predictive analytics works with advanced genetic sciences to identify patients who are at high risk and accordingly provide them with the precaution information. 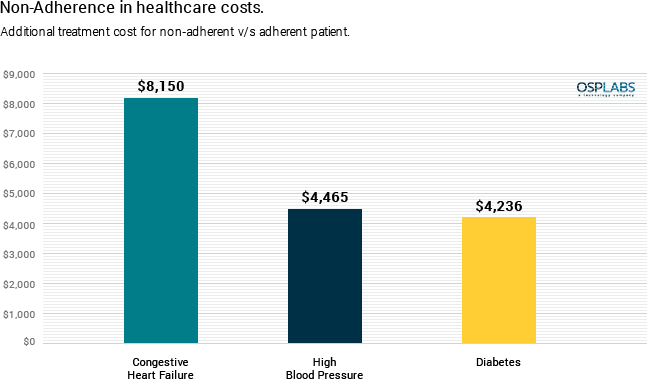 Controlling Insurance Costs: Most companies offer health insurance to their employees as a package. Predictive analytics provides the employers of the company a clearer picture of the cost they will incur in a fiscal year. Companies and hospitals, who are working with insurance providers, can synchronize databases and actuarial tables to develop models and future health plans. Employers might also utilize predictive analytics to analyze which providers may provide them the most effective products for their needs. Patient Engagement: Evidence-based research can be utilized to indicate any changes in lifestyle for patients with the gene (e.g., exercise, nutrient-rich diet, brain games, and frequent memory tests for patients). The patients will become aware of possible personal health risks much earlier as they will get reminders from their genome analysis, through predictive models, which will be communicated by their physicians. Avoid Readmission: It analyzes the likelihood of avoidable readmission or individuals who have a higher risk of developing a new chronic condition, such as diabetes. Predictive Analytics plays a crucial role in measuring and monitoring the readmission rate, and accordingly, plan out how to manage it. Insights gathered from data can help healthcare providers understand health outcomes of individuals as well as forecast high-risk segments within a population. Fraud Detection: Combining multiple analytics methods can enhance the pattern of fraud detection and prevent criminal behavior. 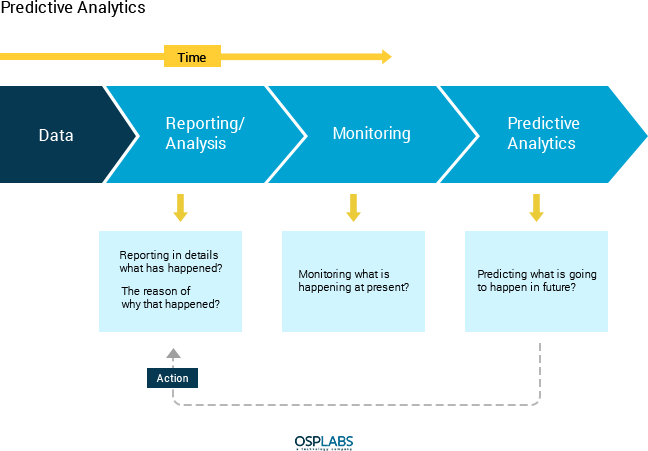 As cybersecurity is massively becoming a matter of concern nowadays, predictive analytics helps in detecting all the essential actions on a network in real time to detect abnormalities that may include fraud, zero-day vulnerabilities, and constant threats. Risk Control: Predicts the financial risk of an individual within a population of patients in a precise, meaningful way. The prediction algorithm includes demographics of the patient, records, diagnoses, procedures, medications and earlier healthcare costs to forecast prospective utilization. It portrays the individual’s severity, risk or burden to normalize a reported outcome or quality metric. Advanced risk adjustment methodologies imbibe a lot of things such as the patient’s socioeconomic status, mental disabilities and the level of insurance coverage. Using the past quality metrics, predictive analytics helps in forecasting the future risk, thus saving the costs of the patients. How will predictive analysis software solutions be the “next big thing” in the healthcare industry? Irrespective of the numerous challenges, predictive analysis can make a big difference in the operations of the healthcare industry. 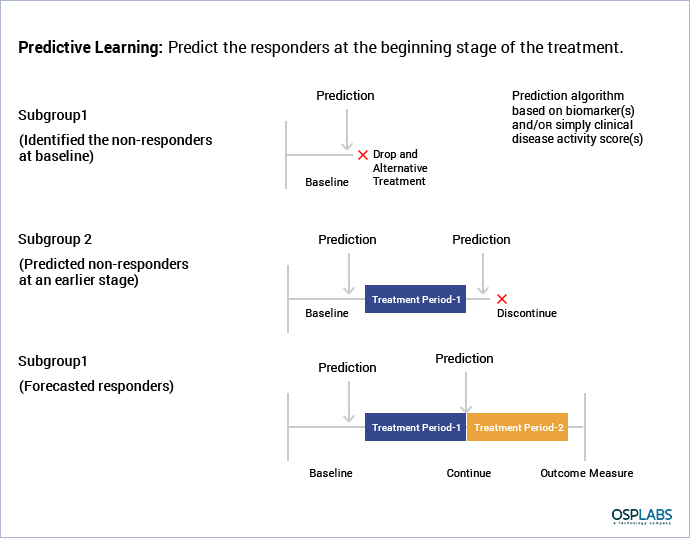 Healthcare organizations that rely on predictive models can make a better decision in the areas such as R&D, surgery, genome study, and many more. Healthcare is shifting from a disease-centered model towards a patient-centered model. In a disease-centered model, physicians make decisions that revolve around the clinical expertise, and data gathered from medical evidence and various tests. In a patient-centered model, patients actively participate in their personalized care and receive information and advice from their healthcare providers. Patients will become better informed, and they can track their fitness level utilizing the information provided to them. A physician will play an active role as a consultant than that of a decision maker, who will advise, warn and help individual patients. Improved decision and analytics-driven treatment will reduce the costs and improve outcomes in the healthcare system. 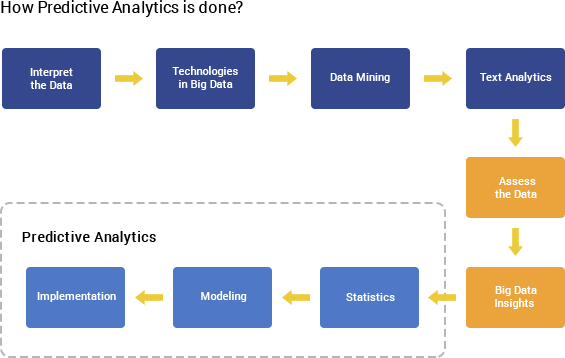 Predictive modeling technology is capable of sieving through the massive data sets and reveal the patterns and trends that co-ordinate with the target data to plan out financial operations.